IEEE 802.11 is a set of media access control (MAC) and physical layer (PHY) specifications for implementing wireless local area network (WLAN) computer communication in the 900 MHz and 2.4, 3.6, 5, and 60 GHz frequency bands. They are created and maintained by the Institute of Electrical and Electronics Engineers (IEEE) LAN/MAN Standards Committee (IEEE 802). The base version of the standard was released in 1997, and has had subsequent amendments. 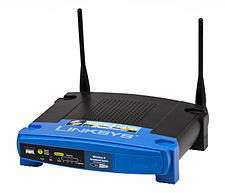 The standard and amendments provide the basis for wireless network products using the Wi-Fi brand. While each amendment is officially revoked when it is incorporated in the latest version of the standard, the corporate world tends to market to the revisions because they concisely denote capabilities of their products. As a result, in the market place, each revision tends to become its own standard. The 802.11 family consists of a series of half-duplex over-the-air modulation techniques that use the same basic protocol. 802.11-1997 was the first wireless networking standard in the family, but 802.11b was the first widely accepted one, followed by 802.11a, 802.11g, 802.11n, and 802.11ac. Other standards in the family (c–f, h, j) are service amendments that are used to extend the current scope of the existing standard, which may also include corrections to a previous specification. 802.11b and 802.11g use the 2.4 GHz ISM band, operating in the United States under Part 15 of the U.S. Federal Communications Commission Rules and Regulations. Because of this choice of frequency band, 802.11b and g equipment may occasionally suffer interference from microwave ovens, cordless telephones, and Bluetooth devices. 802.11b and 802.11g control their interference and susceptibility to interference by using direct-sequence spread spectrum (DSSS) and orthogonal frequency-division multiplexing (OFDM) signaling methods, respectively. 802.11a uses the 5 GHz U-NII band, which, for much of the world, offers at least 23 non-overlapping channels rather than the 2.4 GHz ISM frequency band offering only three non-overlapping channels, where other adjacent channels overlap—see list of WLAN channels. Better or worse performance with higher or lower frequencies (channels) may be realized, depending on the environment. 802.11n can use either the 2.4 GHz or the 5 GHz band; 802.11ac uses only the 5 GHz band. B1 B2 B3 B4 B5 B6 Assumes short guard interval (SGI) enabled. C1 C2 C3 C4 C5 C6 Assumes short guard interval (SGI) disabled. Originally described as clause 17 of the 1999 specification, the OFDM waveform at 5.8 GHz is now defined in clause 18 of the 2012 specification, and provides protocols that allow transmission and reception of data at rates of 1.5 to 54 Mbit/s. It has seen widespread worldwide implementation, particularly within the corporate workspace. While the original amendment is no longer valid, the term 802.11a is still used by wireless access point (cards and routers) manufacturers to describe interoperability of their systems at 5.8 GHz, 54 Mbit/s. 802.11n is an amendment that improves upon the previous 802.11 standards by adding multiple-input multiple-output antennas (MIMO). 802.11n operates on both the 2.4 GHz and the 5 GHz bands. Support for 5 GHz bands is optional. It operates at a maximum net data rate from 54 Mbit/s to 600 Mbit/s. The IEEE has approved the amendment, and it was published in October 2009. Prior to the final ratification, enterprises were already migrating to 802.11n networks based on the Wi-Fi Alliance's certification of products conforming to a 2007 draft of the 802.11n proposal. IEEE 802.11ah defines a WLAN system operating at sub-1 GHz license-exempt bands, with final approval slated for September 2016. Due to the favorable propagation characteristics of the low frequency spectra, 802.11ah can provide improved transmission range compared with the conventional 802.11 WLANs operating in the 2.4 GHz and 5 GHz bands. 802.11ah can be used for various purposes including large scale sensor networks, extended range hotspot, and outdoor Wi-Fi for cellular traffic offloading, whereas the available bandwidth is relatively narrow. IEEE 802.11ax is the successor to 802.11ac, and will increase the efficiency of WLAN networks. Currently at a very early stage of development this project has the goal of providing 4x the throughput of 802.11ac. Across all variations of 802.11, maximum achievable throughputs are given either based on measurements under ideal conditions or in the layer-2 data rates. This, however, does not apply to typical deployments in which data is being transferred between two endpoints, of which at least one is typically connected to a wired infrastructure and the other endpoint is connected to an infrastructure via a wireless link. 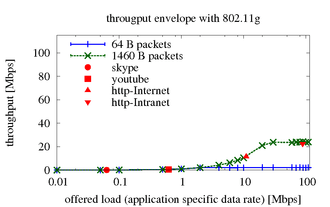 The same references apply to the attached graphs that show measurements of UDP throughput. Each represents an average (UDP) throughput (please note that the error bars are there, but barely visible due to the small variation) of 25 measurements. Each is with a specific packet size (small or large) and with a specific data rate (10 kbit/s – 100 Mbit/s). Markers for traffic profiles of common applications are included as well. These figures assume there are no packet errors, which if occurring will lower transmission rater further. 802.11b, 802.11g, and 802.11n-2.4 utilize the 2.400–2.500 GHz spectrum, one of the ISM bands. 802.11a and 802.11n use the more heavily regulated 4.915–5.825 GHz band. These are commonly referred to as the "2.4 GHz and 5 GHz bands" in most sales literature. Each spectrum is sub-divided into channels with a center frequency and bandwidth, analogous to the way radio and TV broadcast bands are sub-divided. Availability of channels is regulated by country, constrained in part by how each country allocates radio spectrum to various services. At one extreme, Japan permits the use of all 14 channels for 802.11b, and 1–13 for 802.11g/n-2.4. Other countries such as Spain initially allowed only channels 10 and 11, and France allowed only 10, 11, 12, and 13; however, they now allow channels 1 through 13. North America and some Central and South American countries allow only 1 through 11. Since the spectral mask defines only power output restrictions up to ±11 MHz from the center frequency to be attenuated by −50 dBr, it is often assumed that the energy of the channel extends no further than these limits. It is more correct to say that, given the separation between channels, the overlapping signal on any channel should be sufficiently attenuated to minimally interfere with a transmitter on any other channel. Due to the near-far problem a transmitter can impact (desense) a receiver on a "non-overlapping" channel, but only if it is close to the victim receiver (within a meter) or operating above allowed power levels. Confusion often arises over the amount of channel separation required between transmitting devices. 802.11b was based on DSSS modulation and utilized a channel bandwidth of 22 MHz, resulting in three "non-overlapping" channels (1, 6, and 11). 802.11g was based on OFDM modulation and utilized a channel bandwidth of 20 MHz. 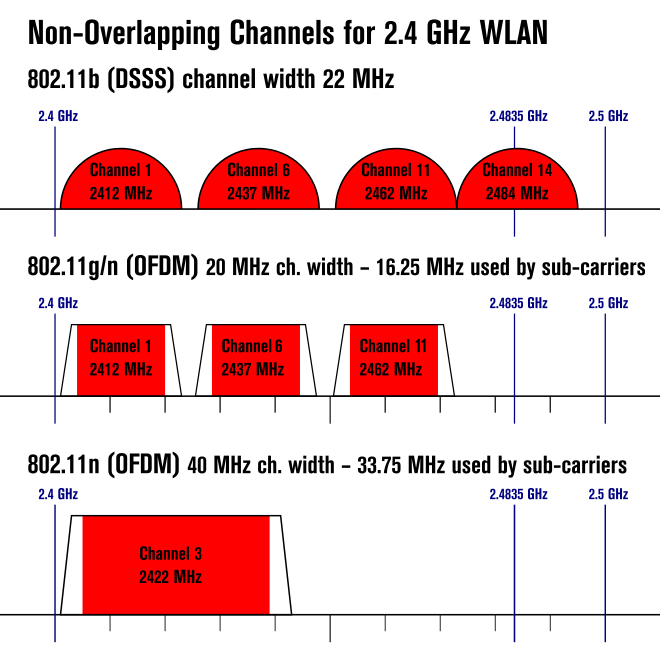 This occasionally leads to the belief that four "non-overlapping" channels (1, 5, 9, and 13) exist under 802.11g, although this is not the case as per 17.4.6.3 Channel Numbering of operating channels of the IEEE Std 802.11 (2012), which states "In a multiple cell network topology, overlapping and/or adjacent cells using different channels can operate simultaneously without interference if the distance between the center frequencies is at least 25 MHz." and section 18.3.9.3 and Figure 18-13. This does not mean that the technical overlap of the channels recommends the non-use of overlapping channels. The amount of interference seen on a configuration using channels 1, 5, 9, and 13 can have very small difference from a three-channel configuration, and in the paper entitled "Effect of adjacent-channel interference in IEEE 802.11 WLANs" by Villegas this is also demonstrated. Although the statement that channels 1, 5, 9, and 13 are "non-overlapping" is limited to spacing or product density, the concept has some merit in limited circumstances. Special care must be taken to adequately space AP cells, since overlap between the channels may cause unacceptable degradation of signal quality and throughput. If more advanced equipment such as spectral analyzers are available, overlapping channels may be used under certain circumstances. This way, more channels are available. An 802.11 frame can have up to four address fields. Each field can carry a MAC address. Address 1 is the receiver, Address 2 is the transmitter, Address 3 is used for filtering purposes by the receiver. An optional two-byte Quality of Service control field that was added with 802.11e. 2. In terms of ICT, an Information Element (IE) is a part of management frames in the IEEE 802.11 wireless LAN protocol. IEs are a device's way to transfer descriptive information about itself inside management frames. There are usually several IEs inside each such frame, and each is built of TLVs mostly defined outside the basic IEEE 802.11 specification. Whereas the OUI (organizationally unique identifier) is used only when necessary to the protocol being used, and the data field holds the TLVs relevant to that IE. Data frames carry packets from web pages, files, etc. within the body. The body begins with an IEEE 802.2 header, with the Destination Service Access Point (DSAP) specifying the protocol; however, if the DSAP is hex AA, the 802.2 header is followed by a Subnetwork Access Protocol (SNAP) header, with the Organizationally Unique Identifier (OUI) and protocol ID (PID) fields specifying the protocol. If the OUI is all zeroes, the protocol ID field is an EtherType value. Almost all 802.11 data frames use 802.2 and SNAP headers, and most use an OUI of 00:00:00 and an EtherType value. 802.11m is used for standard maintenance. 802.11ma was completed for 802.11-2007, 802.11mb was completed for 802.11-2012, and 802.11mc is working towards publishing 802.11-2016. As far as the IEEE Standards Association is concerned, there is only one current standard; it is denoted by IEEE 802.11 followed by the date that it was published. IEEE 802.11-2012 is the only version currently in publication. The standard is updated by means of amendments. Amendments are created by task groups (TG). Both the task group and their finished document are denoted by 802.11 followed by a non-capitalized letter, for example, IEEE 802.11a and IEEE 802.11b. Updating 802.11 is the responsibility of task group m. In order to create a new version, TGm combines the previous version of the standard and all published amendments. TGm also provides clarification and interpretation to industry on published documents. New versions of the IEEE 802.11 were published in 1999, 2007, and 2012. The next is expected in 2016. With the proliferation of cable modems and DSL, there is an ever-increasing market of people who wish to establish small networks in their homes to share their broadband Internet connection. Many hotspot or free networks frequently allow anyone within range, including passersby outside, to connect to the Internet. There are also efforts by volunteer groups to establish wireless community networks to provide free wireless connectivity to the public. "IEEE 802.11: Wireless LAN Medium Access Control (MAC) and Physical Layer (PHY) Specifications" (PDF). (2012 revision). IEEE-SA. 5 April 2012. doi:10.1109/IEEESTD.2012.6178212. ↑ "IEEE-SA Standards Board Operations Manual". IEEE-SA. Retrieved 2015-09-13. ↑ "ARRLWeb: Part 97 - Amateur Radio Service". American Radio Relay League. Retrieved 2010-09-27. 1 2 3 4 "Official IEEE 802.11 working group project timelines". June 2, 2014. Retrieved 2014-06-03. ↑ "Wi-Fi CERTIFIED n: Longer-Range, Faster-Throughput, Multimedia-Grade Wi-Fi® Networks" (registration required). Wi-Fi Alliance. September 2009. 1 2 "802.11n Delivers Better Range". Wi-Fi Planet. 2007-05-31. 1 2 3 4 "IEEE 802.11ac: What Does it Mean for Test?" (PDF). LitePoint. October 2013. ↑ "IEEE-SA - News & Events". Standards.ieee.org. Retrieved 2012-05-24. ↑ "IEEE 802.11n-2009—Amendment 5: Enhancements for Higher Throughput". IEEE-SA. 29 October 2009. doi:10.1109/IEEESTD.2009.5307322. ↑ "Why did 802.11-2012 renumber clauses?". Matthew Gast, Aerohive Networks. Retrieved 2012-11-17. ↑ Kelly, Vivian (2014-01-07). "New IEEE 802.11ac™ Specification Driven by Evolving Market Need for Higher, Multi-User Throughput in Wireless LANs". IEEE. Retrieved 2014-01-11. ↑ Higgins, Tim (2013-10-08). "AC1900: Innovation or 3D Wi-Fi?". SmallNetBuilder. Retrieved 2013-12-31. ↑ Hachman, Mark (2014-01-05). "Quantenna chipset to anchor speedy first 'Wave 2' Asus router". PCWorld. Retrieved 2014-01-11. ↑ Gilby, Christian (2012-12-02). "What Wave of 802.11ac is Right for You?". Aruba Networks. Retrieved 2014-01-11. ↑ Rubino, Bill (2013-05-07). "Cisco will ride the 802.11ac Wave2". Cisco Systems. Retrieved 2014-01-11. ↑ Fitchard, Kevin. "Wi-Fi Alliance gobbles up WiGig; plans to certify devices this year". Retrieved 8 January 2016. ↑ "IEEE Standard Association - IEEE Get Program" (PDF). Retrieved 8 January 2016. 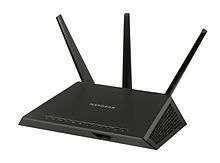 ↑ "TP-Link unveils world's first 802.11ad WiGig router". Ars Technica. Retrieved 2016-01-16. ↑ Lekomtcev, Demain; Maršálek, Roman (June 2012). "Comparison of 802.11af and 802.22 standards – physical layer and cognitive functionality". elektrorevue. Retrieved 2013-12-29. 1 2 3 "Official IEEE 802.11 working group project timelines". 2016-03-23. Retrieved 2016-04-20. 1 2 3 4 5 6 7 Flores, Adriana B.; Guerra, Ryan E.; Knightly, Edward W.; Ecclesine, Peter; Pandey, Santosh (October 2013). "IEEE 802.11af: A Standard for TV White Space Spectrum Sharing" (PDF). IEEE. Retrieved 2013-12-29. ↑ Lim, Dongguk (2013-05-23). "TVWS Regulation and Standardization (IEEE 802.11af)" (PDF). Retrieved 2013-12-29. 1 2 Lee, Wookbong; Kwak, Jin-Sam; Kafle, Padam; Tingleff, Jens; Yucek, Tevfik; Porat, Ron; Erceg, Vinko; Lan, Zhou; Harada, Hiroshi (2012-07-10). "TGaf PHY proposal". IEEE P802.11. Retrieved 2013-12-29. ↑ "P802.11ah Project Authorization Request" (PDF). IEEE. 2010-09-30. Retrieved 2014-02-11. ↑ Churchill, Sam (2013-08-30). "802.11ah: WiFi Standard for 900MHz". dailywireless.org. Retrieved 2014-02-11. 1 2 3 "IEEE 802.11, The Working Group Setting the Standards for Wireless LANs". Retrieved 8 January 2016. ↑ "P802.11ay" (PDF). IEEE. p. 1. Retrieved 19 August 2015. This amendment defines standardized modifications to both the IEEE 802.11 physical layers (PHY) and the IEEE 802.11 medium access control layer (MAC) that enables at least one mode of operation capable of supporting a maximum throughput of at least 20 gigabits per second (measured at the MAC data service access point), while maintaining or improving the power efficiency per station. ↑ "Cuadro nacional de Atribución de Frecuencias CNAF". Secretaría de Estado de Telecomunicaciones. Archived from the original on 2008-02-13. Retrieved 2008-03-05. ↑ "Evolution du régime d'autorisation pour les RLAN" (PDF). French Telecommunications Regulation Authority (ART). Retrieved 2008-10-26. ↑ "Part 11: Wireless LAN Medium Access Control (MAC) and Physical Layer (PHY) Specifications" (PDF). Retrieved 2013-12-05. ↑ "Choosing the clearest channels for WiFi... continued". Retrieved 2013-12-05. 1 2 Garcia Villegas, E.; et al. (2007). 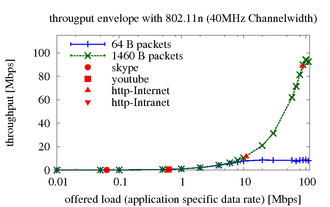 Effect of adjacent-channel interference in IEEE 802.11 WLANs (PDF). CrownCom 2007. ICST & IEEE. ↑ "Channel Deployment Issues for 2.4 GHz 802.11 WLANs". Cisco Systems, Inc. Retrieved 2007-02-07. ↑ "802.11 Technical Section". Retrieved 2008-12-15. ↑ "Understanding 802.11 Frame Types". Retrieved 2008-12-14. ↑ Bonaventure, Olivier. "Computer Networking : Principles, Protocols and Practice". Retrieved 2012-07-09. ↑ D Murray; T Koziniec; M Dixon; K. Lee (2015). "Measuring the reliability of 802.11 WiFi networks". Internet Technologies and Applications (ITA). ↑ "IEEE P802.11 - TASK GROUP AC". IEEE. November 2009. Retrieved 2009-12-13. ↑ Fleishman, Glenn (December 7, 2009). "The future of WiFi: gigabit speeds and beyond". Ars Technica. Retrieved 2009-12-13. ↑ "MU-MIMO MAC Protocols for Wireless Local Area Networks: A Survey". IEEE Communications Surveys & Tutorials. IEEE. PP (99). December 4, 2014. doi:10.1109/COMST.2014.2377373. ↑ "IEEE 802.11, The Working Group Setting the Standards for Wireless LANs". Retrieved 8 January 2016. ↑ Jesse Walker, Chair (May 2009). "Status of Project IEEE 802.11 Task Group w: Protected Management Frames". Retrieved August 23, 2011. ↑ "iOS 8 strikes an unexpected blow against location tracking".